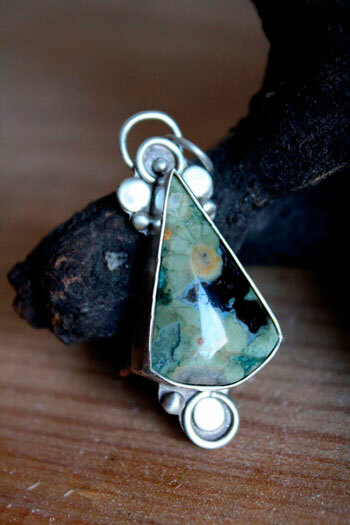 The name of rainforest jasper was given to a rhyolite showing green hues. It is generally opaque with colors such as green moss, cream, orange, white, and some earthy color veins. The word of rhyolite comes from the Greek and means "rocks that flows". 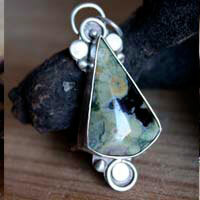 Indeed, this jasper is a volcanic rock that cooled down quickly and is mainly composed of quartz, apatite and magnetite. It is sometimes called Australian rainforest jasper or just green rhyolite. Because of its green color, the rainforest jasper was always linked to nature, vegetation and earth. It would relieve veins problems and more particularly on the skin when the complication comes from blood. The rainforest jasper would help fighting against hypoglycemia and diabetes. This semiprecious stone would stimulate the immune system and would help cleaning kidneys and live. It also has the same properties than the rhyolite in general.